Venezuela has been heavily influenced by cultures from around the world, from indigenous people and Spanish settlers to African slaves. 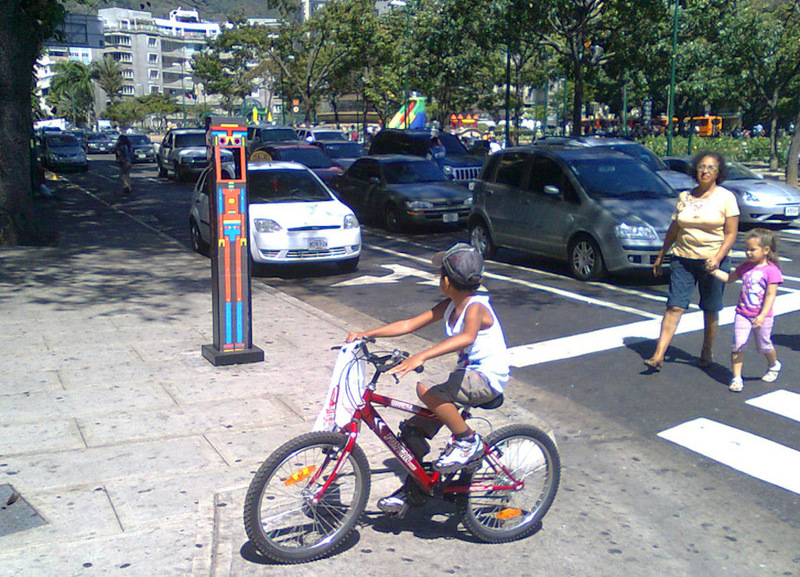 Its capital Caracas boasts a wide array of these cultures and, for some, it has a more progressive feel than the rest of the country. Since the first time I landed in Maiquetía, its people, colours and sounds made me feel that this part of the world was the perfect place to discover. Caracas is a vibrantly Latin city where art, food and music pop up in surprising places. There is a percolating cultural scene, and a smart generation of artists reshaping their cities. That’s the case of Flix, an artist with an innate flair for art. 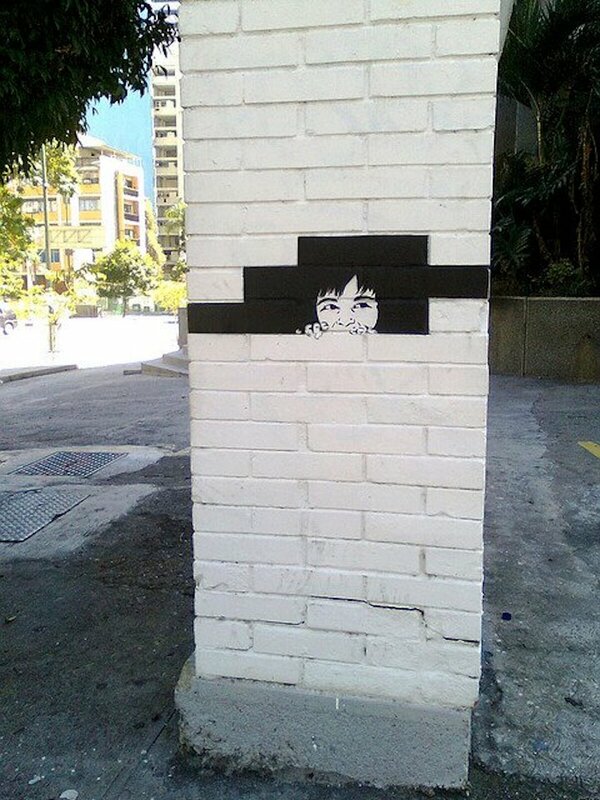 Born and raised in Caracas, this Venezuelan street artist dreams of transforming society through art and culture. Flix considers himself an observer. When he travels outside his hometown, he analyses deeply the space and its urban elements while imagining future layouts. Urban elements are the trigger of his creations and the key in the compositions. He locates his work in unobstructed spaces, or at least, where there is no visual impediment for the passers-by. As he affirms, “I want to leave a mark by transforming forgotten spaces into landmarks”. His work can be found sporadically in traffic lights poles, hydrants, pre-stressed concrete cylinder pipes, abandoned ships, fences, walls and façades in isolated spots. This Big City: How and when did your passion for art begin? 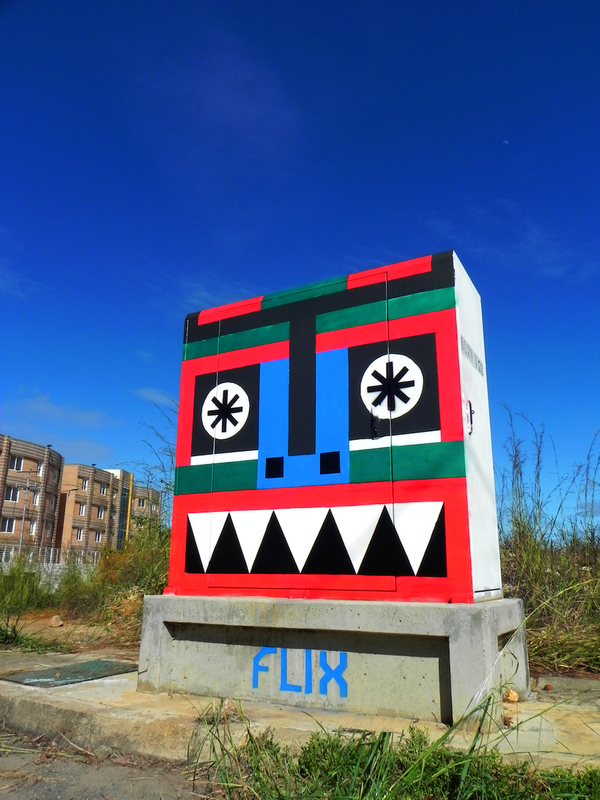 Flix: My love and passion for art was given to me since I was a kid thanks to the strong connection I had with my parents, both practitioners of photography, paint and music. I was interested in the art-of-making, that is why I made the decision to study Architecture. This helped me to define and develop my artistic abilities; understanding urban space, proportions, scales and dimensions. My photography apprenticeship from my father helped me to train my focus as an observer, capturing situations which could have been unperceived by others. Photography plays an important role as I depend on it to report all my interventions due to the ephemeral and dynamic nature that cities arise. My experience on the street dates back to 2003, when the Iraq war started. Back then, I was surrounded by an atmosphere of sadness and rejection towards the war. I decided to make some stickers containing messages against the Iraq conflict and others in favour of peace. Also I made stencils in different sizes to make my message visible and forceful. At the same time, I wanted to place other elements on the street, such as hybrids of different ancestral cultures and characters related to robotics. They were my first totem robots. Two of the main ingredients in your work seem to be geometry and primary colours. I spent all my childhood obsessed with geometry and it was the prevailing element even in my first drawings: straight lines, geometric shapes and compositions with squares, triangles and circles. When I studied Architecture, geometry again was the element I used the most in terms of presenting plans and designing façades or structures. And, when I have to place my art onto the streets, I am quite confident as geometry allows me to interact with the urban space, which is full of orthogonal and geometric elements. I have always debated with my friends who have travelled to other continents that the perception of the colour in Latin America is totally different; colours tend to be more alive in this part of the world because of climate conditions, the inclination of the sun… Caracas is a grey city, dominated by concrete which make the atmosphere monotone. So then, why not take advantage of that to inundate our urban surroundings with colours? Regarding the colour palette, I tend to use yellow, blue and red, the colours of the Venezuelan flag, which in a certain way represent me. Are you experimenting with other techniques? I am in constant motion. I like to research and discover new ways of representation, materials and work with different urban elements. 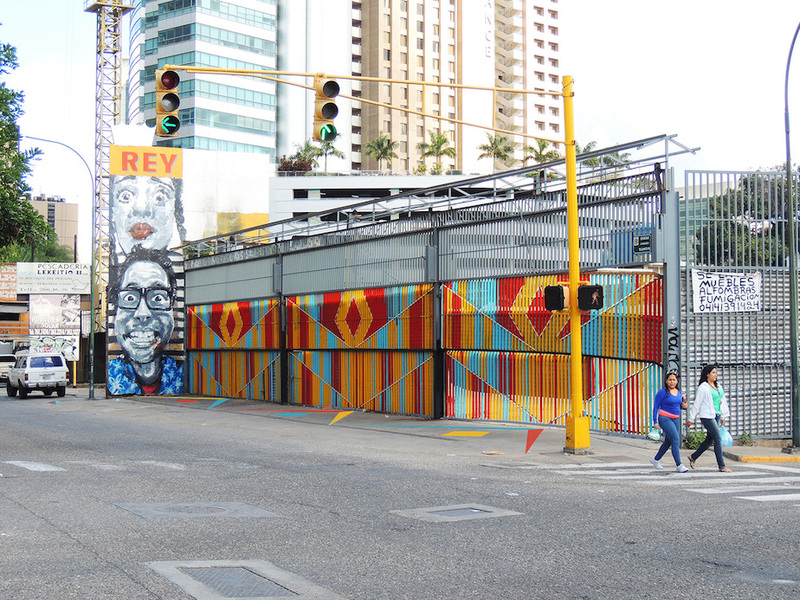 Because of the paranoia and insecurity, the urban landscape of Caracas is defined by physical barriers such as fences and walls, which are proliferating in the city. Not only are they restricting the free passage and becoming visual obstacles but they add more grey to the colour wheel of the city. For a long time, I wanted to transform these fences using coloured ribbons just to change their perception. 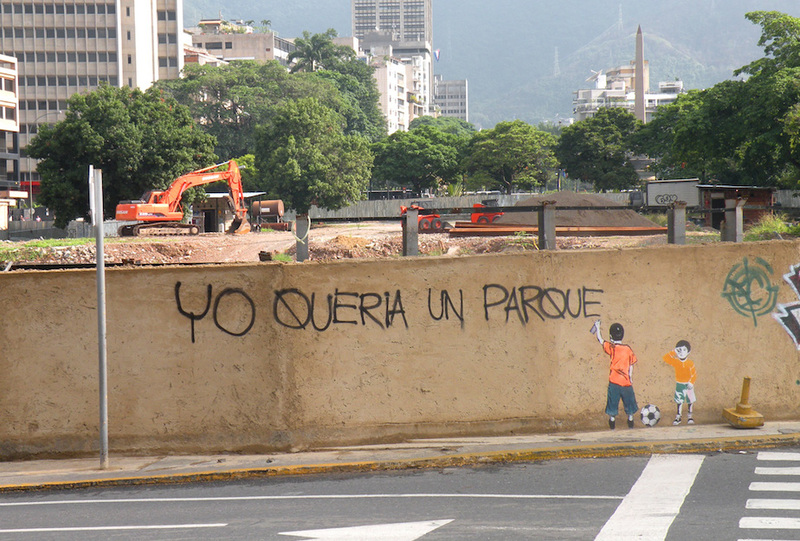 From your point of view, how do you see the street art and graffiti scene in Venezuela and South America? During recent decades, these expressions have gained importance and have been more evident within the conventional public space, which has generated acceptance of street art in our daily life. Artists have been invited formally to exhibit their work in galleries and other spaces; Mayors and private institutions have played a key role in Venezuela. The Street art and Graffiti scene is more active in Brazil, Peru, Argentina and Colombia where international festivals are constantly taking place; they are a good opportunity to interchange points of view and get feedback from others, and vice versa. Why is street art so important? Street art brings art to the street! The street is the stage of our daily life; a place where people from different social strata coexist. 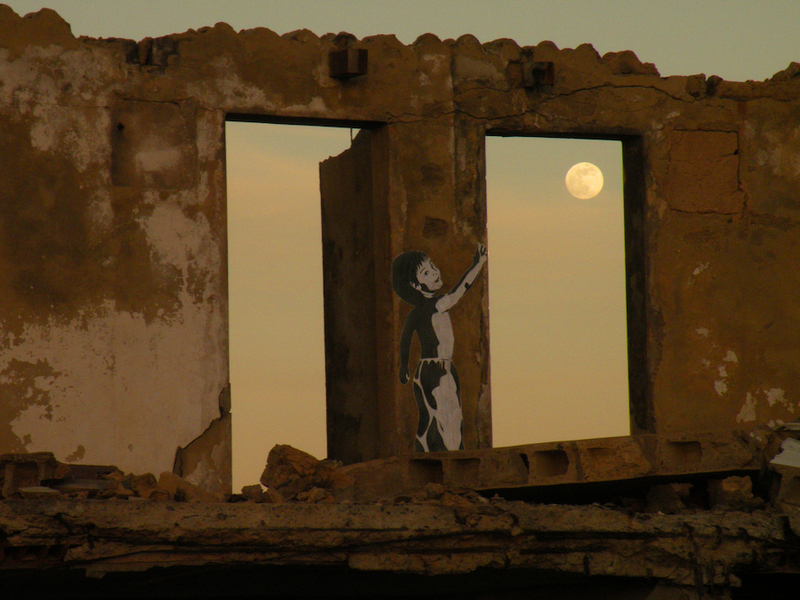 And street art touches all its residents. My intention is to break paradigms, to send out a concise message that somehow wakes the psyche of each individual. I just want to dissolve the constant monotony of walking through the streets. So, you think Venezuela needs more initiatives to incentivise culture? Of course. 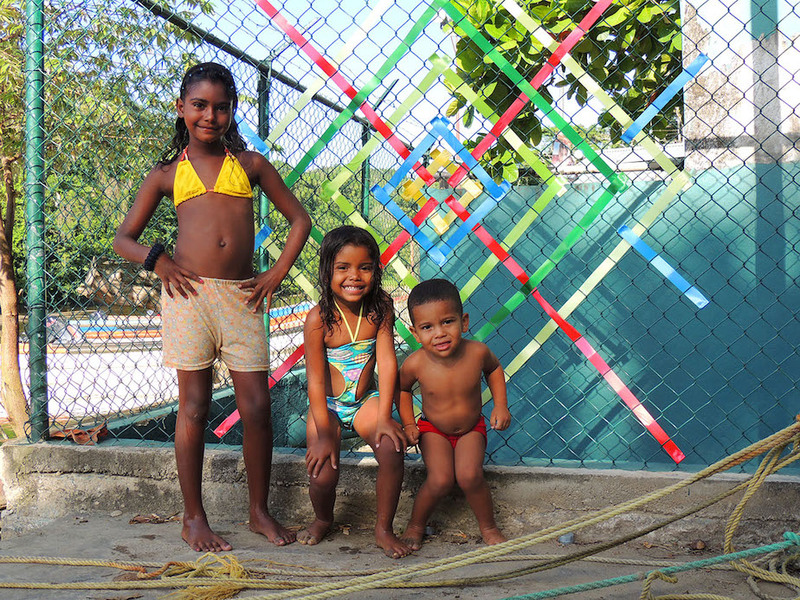 We need more urban initiatives, involving people from the barrios. 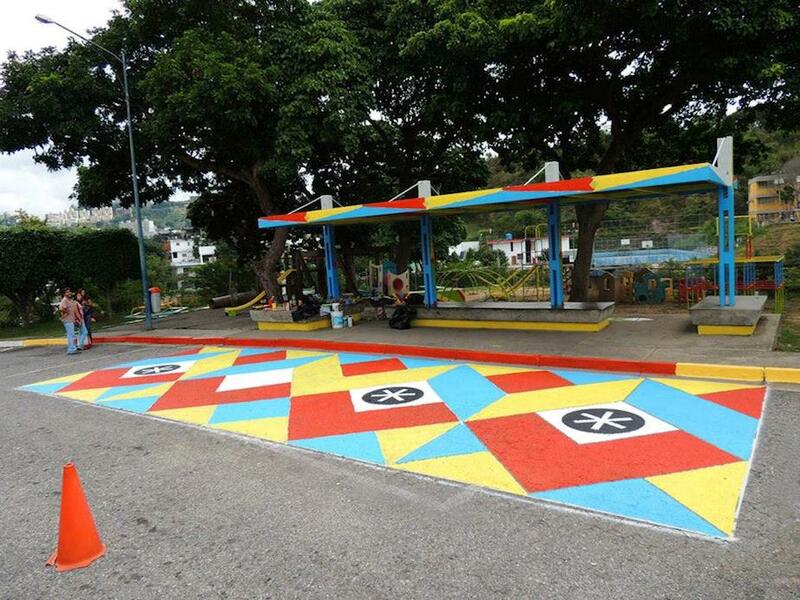 Art must be used as a tool to transform spaces and serve as a complement to educate people. It is needed to recognise art as a sensibiliser because there is a lack of values within the family setting. Do you think your work changes the perception of space? I do think so and I am going to give you an example of that: some telephones were going to be installed in Plaza Altamira, and the council placed on the pavement some poles to hold them. A year later, the poles were still sitting on the ground with no telephones, as they were never installed. These poles ended up crosswise on the pavement having the function of obstructing passers-by. 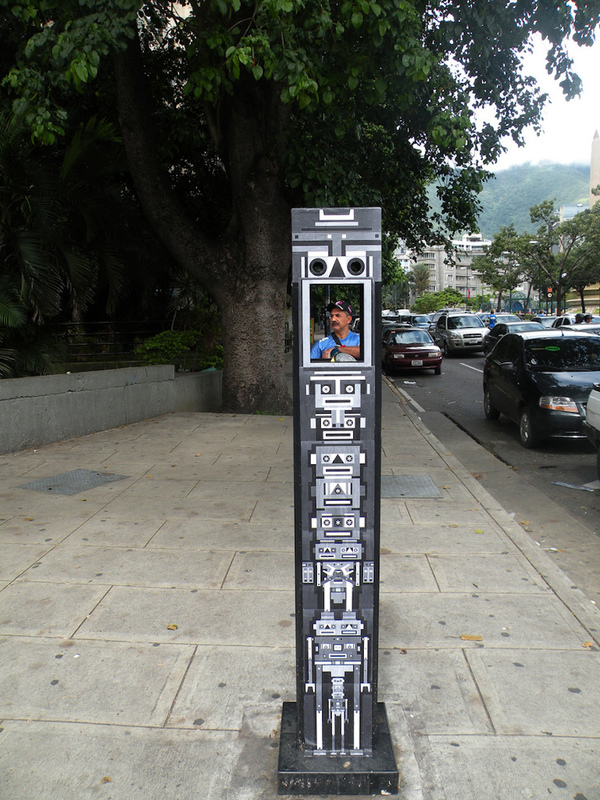 I converted them into urban interacting totems. After the intervention, I observed how people were taking pictures and wondering what they were. 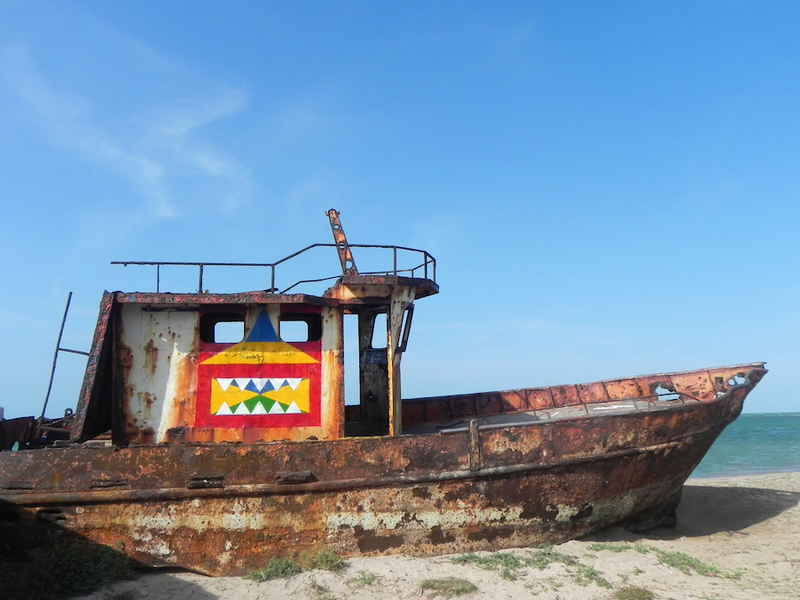 Another anecdote I would like to share is the house of René Hurtado, a fisherman who lives in a tiny house in the Paraguaná peninsula. 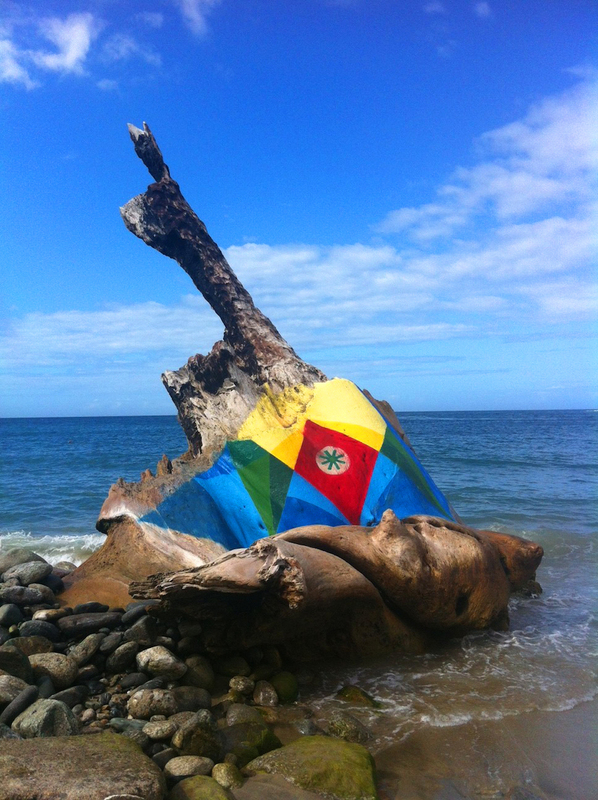 I frequently visit a beach in Cabo de San Román, where René’s house is located. For years, I was obsessed with its façade made out of rotten and grey wood pieces! In one of my trips to the beach, I decided to meet the person who was living behind these pieces of wood and metal and, after a long talk, I suggested him to make a chromatic intervention to his façade. Once I painted it, the remote house was transformed into an enormous canvas full of colours, which were immersed within this beautiful landscape having the sea as background. How does your work affect your life and how does your life affect your work? The effect my work has in my life is a delightful feeling as once I produce something, I can see and feel the reality that surrounds me, and this makes me feel more comfortable and happy with myself – as I can see the city full of colour. It is simply gratifying when I manage to transform positively some spaces of the city. I have the power of making people smile. My life has a huge effect in my work as I put all my dreams, desires, feelings and knowledge into it. Flix believes the message is more important than the person behind it, which is why he remains anonymous. 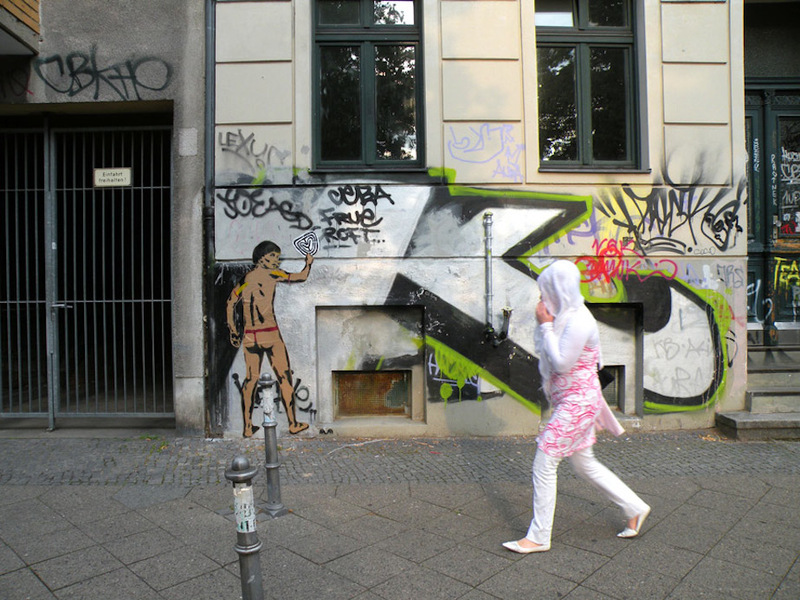 Urban interventions are not legalised and are sometimes considered vandalism, which he cannot understand. 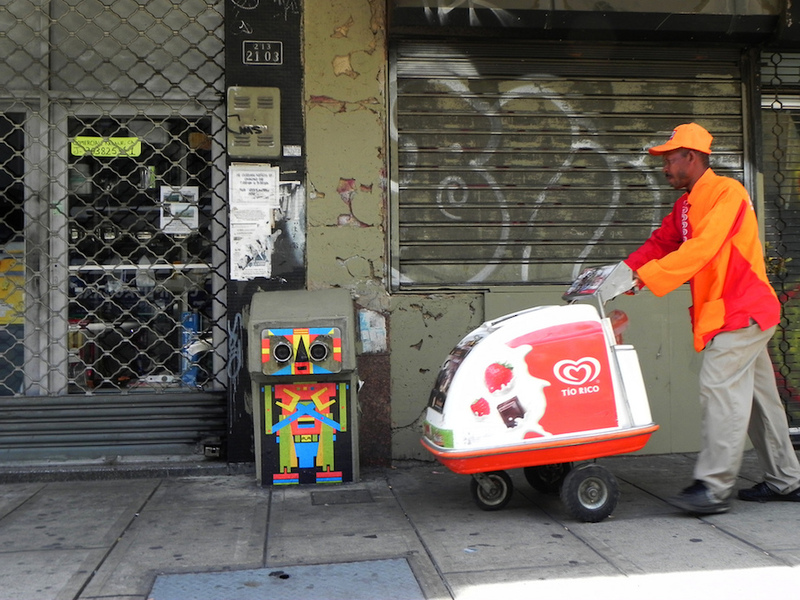 “Imagine a dilapidated building, an obsolete or abandoned urban element on the street. This can be transformed into a beautiful piece of art bringing surprise, a big question mark or simply provoking a smile to passers-by. This cannot be considered vandalism”. We can find Flix artwork in other European cities such as Berlin, Dresden, London, Paris, Barcelona and Madrid, where he had the opportunity to paint a few years ago. His attempts to make people smile are unstoppable.